These little crackers are great for snacking on or to drop into soup, chili or stew. 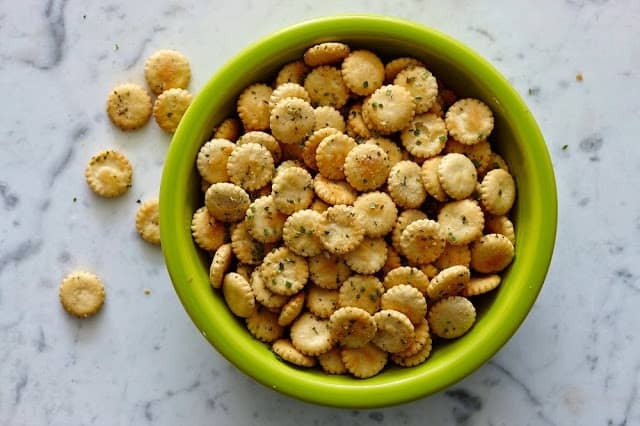 Original ranch oyster crackers are not only delicious, this recipe couldn’t get any easier! By changing the seasoning packet, you easily change the flavor of the crackers. Here on Turnips 2 Tangerines we have two flavors of oyster crackers that go with anything or are great for snacking, chicken noodle soup flavored and taco flavored oyster crackers. This recipe has been around for a number of years. In fact by sister Barb gave me this recipe many years. One year during the holidays, she had everyone over to look at her Christmas tree. That rather bizarre ritual of visiting family and friends over the holiday season, to ‘look’ at their tree. I’m not sure if this holiday tradition is still done today (it’s no longer a practice in my family) but years ago it was very popular. A “Round Robin” is a group of friends or family, that get together during the holidays by stopping at each others house. Let me explain. Ok, lets say you have four sisters and 2 brothers that are all married. They all live within an hour or so of each other. Driving distance. Everyone meets at the first house, enjoys snacks and drinks, (determined by host and hostess per house) visits about 2 hours or so, and on to the next house. So on and so forth. Place crackers in a large resealable plastic bag. Pour oil over crackers and toss to coat. add dry salad dressing mix. Toss to coat. Spread on a jelly roll pan, bake at 250 for 15 to 20 minutes. Cool. Store in an airtight container.